There's a new Super Hero in town and his name is Exterminator Boy. Now I don't mind bugs, really, I don't, as long as they stay outside where they belong. But I really hate it when they hang around, propagating themselves, in my house. That's where Exterminator Boy comes in: he fearlessly captures and subdues the box elder beetles that seem to be everywhere and flushes them down the toilet while exclaiming triumphantly, "b'bye bug!" (I think it's Jackie from CyberChase who says, "b'bye bad guy," so you all probably don't get the reference, since you're probably not big fans of CyberChase). And he's so cute, too! By the way, I have to assume that Batman has headed elsewhere, perhaps back to Colorado, since we haven't seen him around here in quite a while. I don't think Batman does bugs, anyway, though. Here's a picture of Logan taken at his concert, "M is for Music and Movement, A is for Animals and Alphabet" on Thursday. He was a turtle (the only one, I might add--seems like there were 20 bees, in fact, Logan was surrounded by bees, but only one turtle), and briefly transformed into a tree for the squirrel song. Before you pounce on me, I told you that Sundays are not included in Lent, and it's really quite difficult to give up the internet for 6.5 weeks, when you're the CFO of the family and you do all of your banking online. And I thought this was important to share during this season of introspection. We're back from our first real vacation in 10 years, "real" being defined as 1. not involving extended family, 2. staying in a permanent structure, not our own home, that has running water and indoor plumbing, and 3. not having to prepare our own meals. I still need to have a little chat with my wonderful husband about appropriate activity levels for real vacations, but all in all we did well. We had a great time, once we got there. We were supposed to fly out on Sunday, but our flights were canceled due to weather in Atlanta. We were rescheduled for flights on Monday, arriving in Daytona Beach at around 10:30 p.m., which would have put us in our hotel in Orlando at around midnight, which was late, but not too bad. We left Monday afternoon and emerged from the jetway in Atlanta to find that our flight had been delayed for 2 hours. Ug. So we hung out in the airport late at night with our three tired young'uns. The littlest one fell asleep in his stroller, and we settled in to wait near our gate. The scheduled departure time came and went, with no sign that we were ever going to be boarding that plane. Finally, they started to let the passengers board, so I plucked Caleb up out of his stroller, thinking that he would remain sleeping. Nope. He woke up screaming, appalled that we would disturb him at such a time. I shushed and I rocked, and I managed to get him to fall tentatively back to sleep before it was our turn to board, which we did. Scott and I took turns standing in the rear of the plane (luckily our seats were in the 2nd to last row), rocking and shushing until we noticed that all of the passengers were on board. Thinking that this meant we'd be on our way shortly, I sat down, at which point, Caleb woke up and started screaming again. At this point, I will make this long story shorter by telling you that we sat in the plane for another hour before taking off, with our youngest child screaming for most of this time. Now let me just pause here to ask you a question. What is your reaction when you hear a baby screaming on an airplane? Well, I'll tell you what mine is: first, I think, oh, poor baby! And then I think, oh, poor parents! There was a man sitting in front of me whose reaction was neither of those things. I first became aware that he had a problem with my screaming baby when he turned around and huffed at me, "can't you give him a bottle or a pacifier or something to shut him up?" Yes! He actually did. And I was hot. I was tired, and trying to hold it together for all of my kids and this jerk has the nerve to tell me to shut my kid up, as if I wasn't already trying everything I could think of to calm him down. At one point this man actually called someone on his cell phone and proceeded to complain about my baby. He referred to the situation as "Chinese water torture" (which I'm sure is actually much worse than merely listening to a crying baby for 2 hours) and actually held his phone up in our direction so whoever was on the other end could hear for himself. I was so mad. And then, this jerk had the gall to tell the person he was talking to, "pray for me." Well, I had had it at that point. How dare he tell someone to pray for him? He was most definitely not behaving in a Christian-like manner, and if he was going to ask for prayer, shouldn't it be that the child behind him stop crying? He continued, throughout the flight, to throw dirty looks at me from time to time. I expected him to ask the flight attendant to be moved to another seat since we were bothering him so much. I had visions of her getting on the PA and announcing, "is anyone willing to give up their seat to trade with the jerk who can't deal with a crying baby?" and having dozens of hands shoot up to volunteer. I considered, and actually started, kicking his seat at one point, but that wasn't sustainable long term. I thought about putting my gum in his hair. Near the end of the ordeal, when nothing was working, I thought about holding Caleb up closer so he'd really have something to complain about. And then I realized that I wasn't behaving in a very Christian-like manner either, or at least not thinking in a Christ-like way. Believe me, if thoughts could kill, this guy would have been done for. Because he was acting in a disparaging way toward me, and let's admit it, my precious child, I was letting my angry thoughts have free reign in my head. I realized that Jesus would have me turn the other cheek, so I spent some time thinking about what that would look like. I decided that it probably meant that I should apologize for my screaming child, but quite honestly, I'm glad that at the conclusion of the flight this man got up and practically ran up the aisle, because I couldn't think of a way to say anything that wouldn't have sounded sarcastic or ended with me trying to justify the situation. So I did the only thing I could do. I prayed. I prayed for this man who showed such animosity toward me and my baby. I prayed that he would feel the love of Christ. And I kept praying for this man throughout the week. I don't know his circumstances any more than he knows mine, and it was unfair of me to judge him so harshly. None of us on that plane expected it to be so, so late, and all of us were just trying to make the best of it to get to our destinations. So that was my moral insight for the week. I've heard all my life about turning the other cheek, and that I should pray for my enemies, but never have I had such a clear lesson on this topic before. Just in case you ever find yourself in this situation, please know that 1. we feel horrible that our child is crying. We feel horrible that our child is inconsolable, and we feel horrible that you have to listen to it. And 2. we are doing everything we can possibly think of to comfort our child. So we did arrive, and we did have a wonderful time. The highs ranged from ~65 up to 84, and we didn't have any rain all week. On Tuesday we went to the Kennedy Space Center This is the boys sitting in an itty-bitty capsule that two grown men spent 14 days crammed into, orbiting the earth. I had to wonder how they used the bathroom. Wednesday we went to Sea World. This is our pal Shamu, jumping up to say hi. We were in the soak zone, but he didn't get us! The kids were disappointed, but since it was only about 68 that day, I was glad. 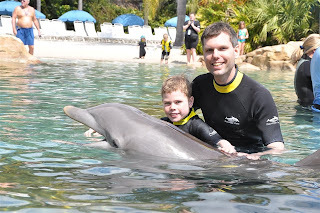 Thursday we went to Discovery Cove. 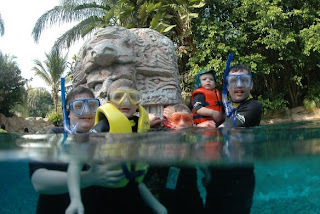 This is us in front of a carved totem-type pole in the tropical river. The photographer said, "remember, I don't have anything to stand on..." so this was the one he took as he was going under. Discovery Cove is where Scott and Cody swam with Tyler the dolphin. They provided us all with wet suits--they even had a little tiny one for Caleb. Friday we went to Aquatica, which is a water park. It was kind of a running joke, I would say as we went in, oh, we should take a picture of that, and Scott would say, right now? And I would say, no, at the end of the day when we're tired and don't want to. So we took this one at the end of the day. They do look tired, don't they? Saturday we went to Busch Gardens in Tampa. We found this pouncing tiger outside of Jungalia. We also found Cody's friend Cole, and Logan's classmate, Madi, at Busch Gardens, along with their mom and grandma. Small world, eh? And Sunday we came home. See what I mean about activity level?